#Autism is part of our reality in the Smith household, but only a small part, so when I was asked to review Coloring Outside Autism's Lines: 50+ Activities, Adventures, and Celebrations for Families with Children with Autism I thought it sounded like a book that would be right up our alley! Unconventional backyard fun: zip lines, trampolines, tree stumps, and even exercise bikes! With tips and advice from dozens of creative families who have found fun with autism and want you to do the same. This book has so many great tips - from suggesting ice cubes as bath toys to tips for helping your child learn to ride a bike, this book covers a multitude of suggestions for both creating sensory stimulation and for getting calm and quiet time in too! I like that this book is written in a tone that doesn't take a one size fits all approach- the authors know that every child on the spectrum is different and so they are able to be creative and give multiple ideas for creating Joy, Fun and Togetherness. I found inspiration in its pages including some great ways to adapt holiday celebrations and one of my favorite things - some cool Halloween costume ideas for kids with sensory issues. For me, I've always bought Liam pajamas and used them as a Halloween costume (He was a race car driver the past few years), but having more ideas in my back pocket as he gets older will certainly be a bonus - plus, just reading about the three simple costumes mentioned got my creative juices flowing! You can get the book at Amazon.com, Barnes and Noble and other fine retailers! And, for a limited time, Sourcebooks has made many of their Autism and Aspergers eBooks, including this one available for just $2.99 each! 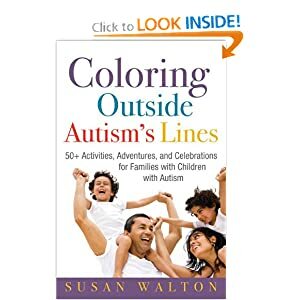 Susan Walton is the author of "Coloring Outside Autism's Lines," published by SourceBooks, Inc., which encourages families to embrace and enjoy life when a family member is affected by autism. She is the parent of an adventure-prone child with autism as well as a set of twins who are not far behind when it comes to searching for fun. She runs the Peninsula Parents of Special Needs Kids group in Northern California and is on the Board of the Best Day Foundation, an organization that provides outdoor adventures like surfing and snowplay to kids with special needs.